Houghton Mifflin Harcourt, 9780544219885, 320pp. Following the James Beard Award–winning Gluten-Free Girl Every Day, Shauna James Ahern and her husband, Daniel Ahern, have created a collection of comfort-food classics that are all unbelievably and amazingly gluten-free. Cinnamon Rolls with Cream Cheese Frosting, Chicken-Fried Steak, New England Clam Chowder—the country’s most beloved dishes, reinvented. Of course, it wouldn’t be true comfort food without dessert, and Shauna aptly provides plenty of delicious recipes for sweets lovers. There’s Pecan Pie, Red Velvet Cake, and even a version of those treasured Thin Mint cookies. Shauna and Daniel tested the recipes over and over again, so these dishes are as easy and foolproof as possible for at-home cooks and her thousands of devoted blog followers. This cookbook also includes all the basic bread recipes readers need to keep making classics at home like Pizza Dough, Sandwich Bread, Hamburger Buns, and Pie Dough. 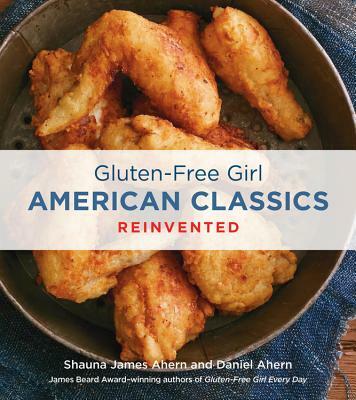 Gluten-Free Girl American Classics Reinvented is Shauna’s best assortment of recipes to date.